These front panels are 2 mm thick aluminium and are pre-cut for up to three DIN size controllers, depending on the size of the enclosure. The kits are simple to assemble, requiring drilling three holes with the provided template. 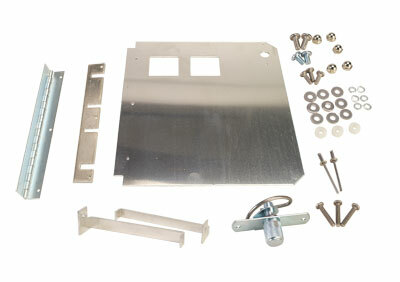 All stainless steel hardware is included along with installation instructions. These kits are available for two IP66 plastic enclosure sizes, 305 H x 254 W x 152 D and 406 H x 350 W x 203 D. Rear mount sub-panels are also available for mounting additional electrical components. 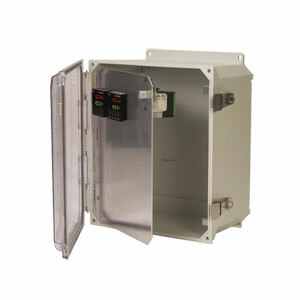 OM-AMU series non-metallic fibreglass enclosures are designed to insulate and protect electrical controls and components in both indoor and outdoor applications and are especially well suited for higher temperatures and corrosive environments. These IP66 fibreglass JIC junction boxes feature clear polycarbonate covers with a variety of screw or latching options and are the solution for weatherproof applications. M16 Cable Gland Strain Relief with clamping range for cables 3.5 - 10mm, 5 per package. Nota: Comes complete with installation instructions.